My first impulse last week, faced with a selection of new Volkswagen Ups to try, was to plump for the BlueMotion Technology edition. It is the leanest and most efficient of the various new Up models, after all. But every Up is a small, simple and frugal little city car, so there’s more than just one model you might reasonably consider if you have a green conscience. Particularly if you live nowhere near London (and thus aren’t bothered by the 100g/km congestion zone threshold). Or live at the top of a very steep hill (which the 59bhp BlueMotion model can find a bit of a challenge). Upping the stakes to the “High Up” trim level brings a 15bhp increase in engine power to 74bhp (or 75PS under VW’s metric power system). While it’s not nearly enough to transform the Up into a blistering hot hatch, it does feel a lot less breathless when demands are high. Floor the throttle when joining a busy motorway, for example, and you won’t be left wondering if you might run out of sliproad. Wringing more power out of the same 999cc three-cylinder engine naturally comes at the expense of worsened economy and emissions. But it’s all relative: 108g/km and 60.1mpg are pretty good results for a petrol engine without any stop-start trickery. Insurance also climbs from the BlueMotion’s basement 1E to the similarly subterranean 2E. In short, cover isn’t going to come a lot cheaper for a new car. 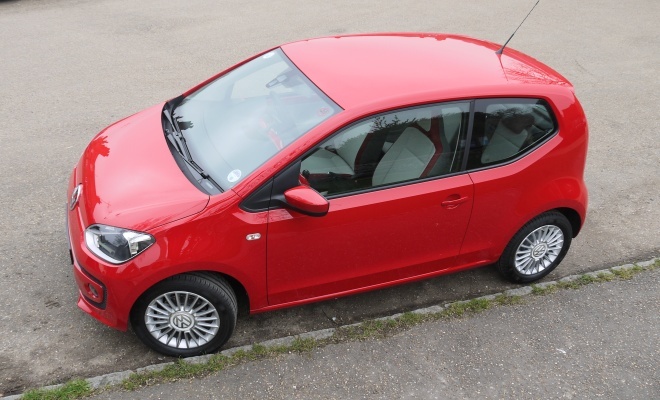 The car itself starts at £10,390 and comes with a reasonable number of boxes ticked, including aircon, 15-inch alloys, remote central locking, a leather trimmed wheel and heated front seats. There’s a Scrabble bag of stuff keeping the tyres safely stuck to the road, including ABS, ESP, brake assistance, an electronic differential lock and traction control. There are front and side airbags, and the reassurance of a five-star Euro NCAP result. The city emergency braking system that will save you from low-speed crunches costs a sensible £225 extra, while an additional £350 will add rear parking sensors, cruise control and a trip computer. 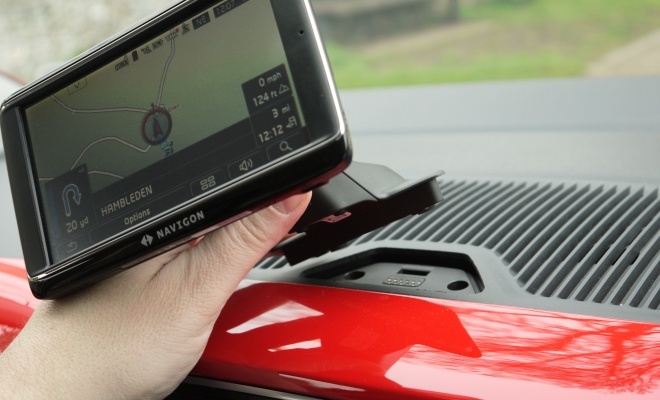 The detachable “Maps & More” screen that sprouts from the top of the dashboard is standard fit for the High Up model, and includes a good, intuitive satnav system as well as Bluetooth for media streaming and telephone duties. The satnav barks at you in a gruff male voice by default. Hopefully there’s a gentler and less authoritarian voice lurking in the options. And detaching the screen is a questionable benefit, given that it comes away complete with its ball socket and mounting arm, rather than sliding out of a cradle to present a clean tablet format. If you were to carry it around in your pocket you’d look distinctly pleased to see people. My test car underscored the importance of choosing options you can live with – its garish red and grey interior threw me right back into the 1980s, a decade I wouldn’t want to revisit on every journey. The interior door tops will always arrive finished in your choice of exterior paint – sober metallics are a £450 option – while the dashboard plastic can be glossy black, red, white or silver. Lower level plastics can be dark or pale grey, while seat fabrics run the gamut from garish to gloomy. Whatever trim you choose, the driving experience will feel much the same in all versions of the Up. The car offers good elbow room for occupants but still feels narrow and nimble enough for choked city streets. It can be noisy, particularly at high speed and high revs, but not intolerably so. The interior is comfortable, pleasant and (colours aside) modern with useful cubby holes and power sockets. 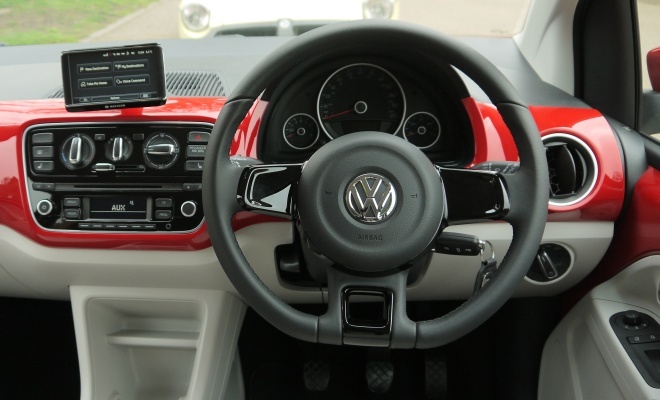 It might be a VW but don’t imagine you’ll find superior quality, luxury or charm. There are no clever cupholders, no damped grab handles, no illuminated vanity mirrors and no centre armrest. It’s all well designed and nicely screwed together, but it still feels like basic budget transport. A premium product like a modern Mini it is not. If it were my money? 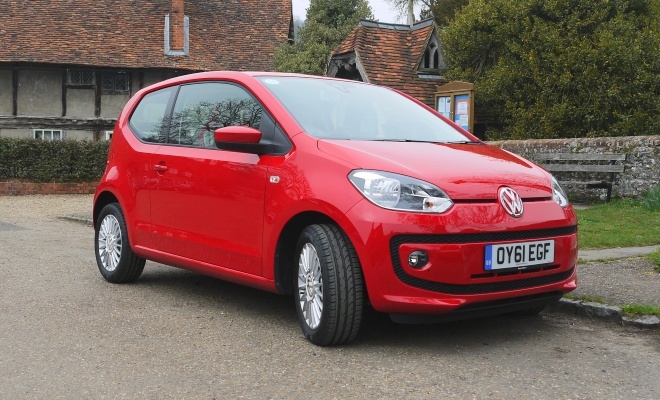 I’d keep things clean and simple, save £1,000, and go for the BlueMotion model. And probably not in bright red.